Fantagraphics and Kickstarter UPDATE | 'TAIN'T THE MEAT… IT'S THE HUMANITY! Seattle based comic book publisher Fantagraphics are currently running a Kickstarter pledge scheme to raise money to fund it’s 2014 Spring Season of books and Graphic Novels. Fantagraphics are one of the most important and supportive of independent publishers who offer a great and diverse selection of books and I would urge anyone who considers themselves a comic book fan to support their efforts. Originally founded in 1976 and run by Gary Groth and Kim Thompson Fantagraphics quickly gained a reputation for publishing alternative comics. Over the years they have championed the work of Dan Clowes, Chris Ware, Peter Bagge, Gilbert and Jaime Hernandez, Linda Medley, Stan Sakai and many, many others. Amongst their large catalogue of titles is a massive 25 volume collection reprinting every one of Charles M. Schultz’s Peanuts strips, as well as Hal Foster’s run on Prince Valiant and collections of EC Comics’ range of horror and science fiction stories from the early ’50s (I reviewed the first volume here). They also publish a range of titles by European writers and artists, such as Jacques Tardi and Lewis Trondheim, which were edited and translated by Thompson. Sadly Kim Thompson passed away earlier in the year after a brief battle with cancer and Fantagraphics were forced to cancel the 13 books he was working on, disrupting the company’s cash flow. So on the 5th November 2013 they opened a Kickstarter scheme to help raise the $150, 000 necessary to guarantee their Spring 2014 season of books. Thankfully they raised that amount within seven days so their new season of books will go ahead as planned. Since the pledge period on Kickstarter runs for 30 days Fantagraphics have added another $50k to the target – this extra cash will be used to fund the release of the books Thompson was working on before he died, a fitting tribute. The pledge period has another 11 days left and they have just under $9k to go before hitting that $200k target, so check out the site and see what your pledges will buy as there is a fantastic selection of offers available from $1 to $2,000. I’ve just pledged $35 (£21.50) for a limited edition signed print by EC Comics legend Jack Davis (only fitting as his 1952 horror story from Tales of the Crypt inspired the name of this site). I’ll post a scan of the print when it arrives, which should be early next year. Fantagraphics are an important publisher of some of the finest comics in the medium and by supporting them you’re helping a great company to survive. And you’ll get some really cool stuff too. 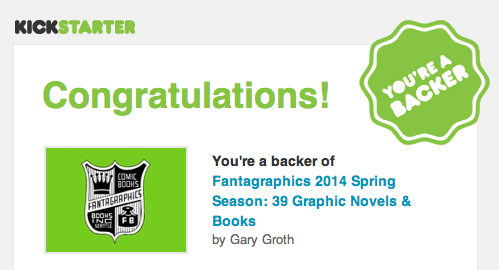 Click here for a link to Fantagraphics Kickstarter page. The Kickstarter funding scheme finished this morning with a whopping $222,337 raised, more than $70K over the original target. It’s a fantastic achievement that now guarantees the release of Fantagraphics’ Spring Season of books and all 13 of the titles Kim Thompson was working on before his death.